Basically, the concept is that you can’t have more than two of the following: cheap, good, and fast. Each is a constraint on the other two. 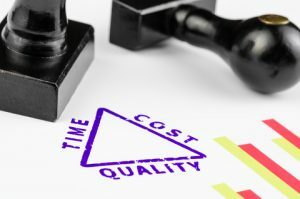 Price, quality, and time are interrelated. We’re not going to define the terms with precision. What is cheap or inexpensive to one “buyer” of services may be too expensive to another. At one level, the lowest level, quality (or lack thereof) is readily discoverable (though many don’t see it). At the upper extremes, disagreements over “quality” seem like disputes over personal preferences rather than substance. [Here’s an example. What difference does it make if a defined term is presented as (“Premises”) versus (“the Premises”) or whether both styles are used in a document? Does the meaning of the document turn on the difference?] As to the time element, what is “too long”? Is too fast ever an issue? Basically, quality takes time. And, time means money. So, it you want extreme quality, you need to pay for the time it takes to achieve it. Cheap means less time spent on the task or the use of those who charge less (because the market places a lower value on their work). So, if you want cheap, you’ll be sacrificing quality. If you want fast, you need to give up on either quality or price. Fast means overtime (or premium rates) or, more likely, double teaming. Let’s translate this to our business – reaching and memorializing deals. Let’s say you want quality delivered fast. You’ll need to engage people with a higher level of experience and talent. Ones who quickly “see” solutions. They charge more than women and men who have the talent to reach the same result, but need more time to get there. We’re not talking about comparing competent negotiators/draftspeople to inept ones. We’re looking at how long it takes to figure out quality solutions; how long it takes for people to reach agreement. So, if you want good and fast, open your checkbook. Now, what about fast and cheap? The more time spent poring over issues and the more re-reading of documents, the more time the deal takes. So, doing things “fast” means “letting stuff go,” intentionally or unintentionally. There is just so much that one person can do in a day. Quality will suffer. How about fast and (high) quality? Hire the best (and pay the price) or hire a team to crank out more work per day. That’s how you get fast, but at a price. Is there a solution? Of course there is. For some, it’s just that you ought to loosen the purse strings. Ask yourself: “Am I arbitrarily setting the price, and why?” What about quality? Think about your return on investment. A Prius and a Hennessey Venom GT (270 mph) are both “street legal” and will get you to work at the same time. Why pay for the Hennessey Venom ($1.2 million) when a $28,000 car does the job almost as well? And then, there’s time! Why is “tomorrow” or “by Friday” so important. Certainly, projects need to be completed within a reasonable time, but what is reasonable? Is every first draft needed in two days? Why? It costs money to get someone’s exclusive time. It means they have to keep a “loose” schedule so that when someone wants an exclusive block of time, they’ll have it ready and waiting. The way that works is that they need to charge more. Someone has to pay for the idle time. That would be you. Time is the most flexible variable. Here’s a depiction of a common situation. After waiting “too long,” you get the first draft of a lease, loan document or purchase agreement. You’ve been getting anxious and getting the draft doesn’t help. So, you want a fast turn-around. Fast means less time invested in a responsive draft. The way that’s done is to skip over issues or to crank in “stock” responses, ones that identify the “disagreement,” but not ones that offer an acceptable solution. So, what happens? You’ve just created more work for the other side. It will take more time to craft a response. Then, you’ll go back and forth over “language” and, along the way, you’ll identify more issues and the process goes on. The alternative is to spend more time up front – prepare a comprehensive, quality response to the initial draft. Almost always, the overall process to reach completion will take less time and cost less and be of better quality. Basically, though one may get lucky at times, keep the Project Management Triangle in mind. Ask yourself: “For this particular deal, what can I let go of, price, quality or time?” You’ll be surprised that there is always an answer.